...realizing your bald spot is, in fact, pretty bald. ...waking up and being sore for no apparent reason. ...turning down the volume while blasting '90s music alone in your car because it's "too loud." ...realizing the only reason why you're listening to Pearl Jam is because only God knows what the kids are listening to these days but my goodness it sounds like garbage. Drake? Post Malone? Cardi B? Who are these people? Are they people? Or robots? Because robots make music these days. Crazy. And most pertinent to this review: realizing that some cereal tastes much better without any added sugar. Such is the case with Trader Joe's Organic Coconut Almond Chia Cereal. That's a lot of natural goodness here. The inherent earthy graininess of the flakes. Tasty toasty almond slivers. Light coconut flavor all abound. If anything there's a lack of chia seed clusters, at least in the top half of the box thus far...maybe them little buggers worked all their way down. Listen to me. Complaing about not enough chia seeds in my cereal. I do sound old. It's tasty, tasty cereal for sure. And I'm not usually a cereal person. The flakes are solid and crunchy enough to be fully submerged in milk and still maintain a high factor of munchitude. Probably, if you're a yogurt and cereal person, this would work. And even adding some banana wouldn't be the worst idea. 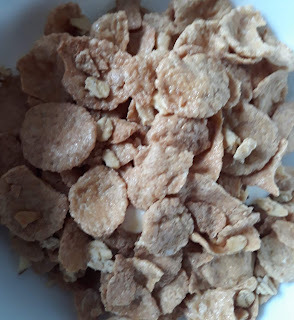 My one small complaint, though: When I added milk, some of the bites tasted almost vaguely buttery. I'm wondering if it was the wetness unleashed/embellished some of the coconut and oil a little bit. It's not noticeable when dry, and I didn't taste it as much the second time around...but it was a little weird. All those grains...and proteins...and fiber...and calories...this is hearty, filling cereal for sure! A few small handfuls killed my hunger for quite some time. Anyways I mentioned the "tastes worse when sugar added" thing to Sandy, and she gave me one of those "well duh" looks before stating many cereals taste that way. It's worth noting she's almost exactly two years older than me and females mature quicker than males and all that...so I'm catching up, love. But yeah, extra sugar kinda kills off half the good stuff about this cerea. Which is a shame because it's pretty darn good in fact. 4.5 from me, 3.5 from the older, maturer missus. I really like this! Have bought it several times- I don’t like cereal with milk, but this is great as a handful ontop of yogurt with some berries. The flakes stay nice and crunchy. 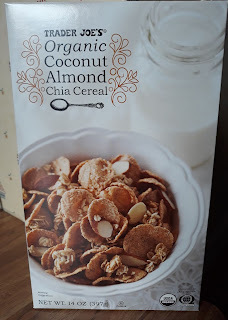 I usually add chia seeds to my yogurt anyways, and do even with this cereal since the chia seeds are negligible and certainly not a full serving of them per serving of cereal. Nice almondy flavor, coconut is hard to detect. I bought this once and was so disappointed. I love coconut and found it very bland. There is definitely a collection of almonds and chia seeds at the bottom though! So maybe if I had shaken the bag, it would have been better than the flake-heavy first try. I’m confused about your comment that the cereal tastes better with no added sugar. The cereal has multiple forms of sugar added so it isn’t a no adddd sugar cereal.